Taipei International Machine Tool Show, known as TIMTOS, jointly organized by TAITRA and TAMI, will open its grand doors March 4-9, 2019, across four exhibition halls — TWTC Hall 1 and Hall 3, Taipei Nangang Exhibition Center, Hall 1 and Hall 2. Indeed, Taipei Nangang Exhibition Center, Hall 2 will officially open in March 2019, to accommodate more exhibitors. With this new venue, TIMTOS will house a total of 1,230 exhibitors in 7,000 booths, creating a new record and becoming the world’s third largest machine tool trade show in 2019. TIMTOS is an important platform for domestic and international companies to showcase their latest products. It also serves as a springboard to expand their businesses to the Asian and global markets. Most of the major machine tool companies from home and abroad will be participating at the show next year, including Taiwanese leading companies such as FFG, Tongtai, Hartford, CHMER, YCM, Victor Taichung, Goodway, FEMCO, Chin Fong, SEYI, PMI, HIWIN, and DELTA. An upward trend of global participation can be seen in the show history of TIMTOS. Next year, there will be overseas exhibitors from 26 countries including Germany, Switzerland, Italy, Netherland, Denmark, U.S., Turkey, Japan, Korea, Singapore, and China. 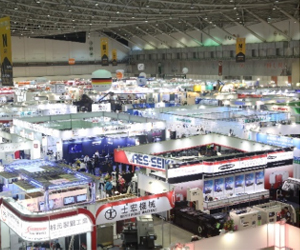 Renowned global corporations such as MAZAK, DMG MORI, Mitsubishi, THK, Heidenhain, Siemens, GF, Universal Robots and Haas Automation will also be exhibiting at the show. Moreover, the U.S., Denmark and Turkey are setting up national pavilions for the first time, alongside Germany, Switzerland, and China that have joined as national pavilions for many editions. In response to the Fourth Industrial Revolution, TIMTOS 2019 will highlight ‘Industry 4.0 & Smart Manufacturing’ and ‘AI Technology’ by showcasing digitalized solutions that integrate machine tools, industrial robots, sensors, IoT, big data analysis, machine learning and AI technology to help manufacturers achieve ‘human-machine collaboration’ and make automated production lines more efficient and resilient. The organizers will also hold the second TIMTOS Summit where industry experts and top executives from firms such as Optomec, DMG MORI, ABB, and Heidenhain will offer their insights on future trends in four topics —‘Machine Intelligence and AIoT’, ‘Additive Manufacturing’, ‘Automotive Manufacturing Revolution’ and ‘Innovation in Aerospace Manufacturing’. The Summit will undoubtedly be an inspirational event for industry players to master the latest industry trends. For more information about TIMTOS 2019, please visit: www.timtos.com.tw.